This fascinating and thought-provoking documentary explores the process by which a modern myth is created. An engaging blend of mystery story and solid anthropological field research, the film illustrates how the people in a small village in eastern India have come to believe that the Buddha was born in their village, despite ample evidence to the contrary. Their belief goes against the view of most experts and most Buddhists, who maintain that the Buddha’s birthplace is in southern Nepal, more than 400 miles to the north. In 1928 a stone inscription written in the ancient Pali language was found in Kapileswar, a small village in the state of Odisha. The inscription declared that the Buddha was born there. Since its discovery, scholars have contested the authenticity of the Kapileswar inscription and the truth of its claim. The stone inscription has since mysteriously vanished, making it difficult to arrive at a definitive conclusion. For many decades the Hindu villagers paid no attention to this inscription and its claim, but in the 21st century they have created a ceremony celebrating the birthday of the Buddha along with a myth depicting how the Buddha was born there. Anthropologist James M. Freeman lived in Kapileswar during the 1960s and ’70s, when he collected information for his books on the village temple and the people of the village. At that time, there was no Buddha Birthday ceremony in the village, and there was no Buddha myth. In 2007, Freeman returned to Kapileswar, along with anthropologist Annapurna Devi Pandey, who was born near the village but now lives and teaches in the U.S. The film follows them as they search for the lost inscription and examine why, after several decades of indifference, the villagers now have taken up the claim that their village is the Buddha’s birthplace and hold onto this belief, even though most experts reject their claim. The film shows that Kapileswar village is indeed located in a region with an ancient Buddhist tradition of historical importance, with vast monumental archaeological ruins. 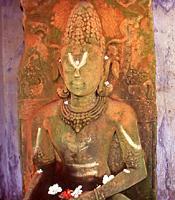 Kapileswar is located at the site of one of the most important events in world Buddhist history. Visible from Kapileswar is Dhauli hill, the place where the emperor Ashoka, after converting to Buddhism, constructed a stone elephant symbolizing the Buddha and set up a stone edict indicating his intention to spread Buddhism throughout the world. No one questions the authenticity of these Buddhist relics, but the same cannot be said of the Kapileswar inscription. Freeman and Pandey uncover new evidence implicating its authenticity, which many experts now agree resolves the controversy. But Freeman and Pandey make an additional unexpected and significant discovery. They find that the villagers have created a new myth to go along with their new ceremony of the Buddha’s birthday. This is a myth, not in the sense of a false story, but of a sacred tale, involving sacred events and people, in a sacred time and space, connecting the people of the village to this sacred world. One of the villagers, a maker of myth, tells the story and points to the exact place where, in the villagers’ version, the Buddha was born. With its “sensitivity and flair,” its vivid and colorful imagery, and its sophisticated scholarship, The Myth of the Buddha’s Birthplace will engage students and engender thought and discussion in a wide range of courses in cultural anthropology, India and South Asia, Hinduism and Buddhism, and all religious studies. It was produced by James M. Freeman, Emeritus Professor of Anthropology, San Jose State University, and Annapurna Devi Pandey, Lecturer in Anthropology and South Asia Studies, University of California, Santa Cruz. Additional material and a short trailer for the film may be found at the producers´ web site: themythofthebuddhasbirthplace.com.